About meFamily: Married since 2001, with three children, a boy and two girls. Interests: I love reading, composing on the piano, playing boardgames, cartooning, and Transformers. You can follow my reading journal here. My library is predominantly sci-fi and fantasy, though much of the standard-fare "epic" fantasy (Brooks, Eddings, Feist) belongs to my wife. I basically grew up reading the Pocket Books Star Trek novels, so you'll see a lot of those (the complete TOS numbered series, in fact.) Up through college, I read mostly sci-fi, and very little fantasy (besides Lord of the Rings, natch) but lately I've been branching out into that genre, while avoiding the aforementioned mainstream authors. 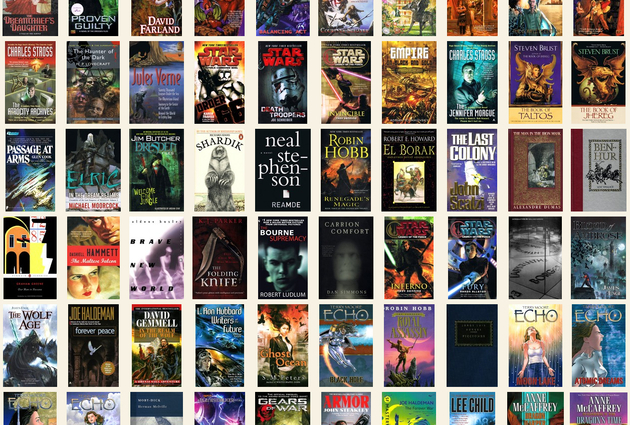 YOUR LIBRARY - This collection is for books that I own (mostly sci-fi/fantasy fiction) that don't fall into another "owned" collection. EBOOKS - This is for stories and books loaded onto my Kindle Touch. The digital version gets its own catalog entry, even if I've got a physical copy (or copies) as well. "Date acquired" is the day it was downloaded onto my device. Books tagged "homemade file" refer to MOBI files I created myself (or modified heavily from another source) using the Calibre e-book management software. COMIC BOOKS - Comic books (owned), including graphic novels and trade paperback collections. All entries tagged "comic book" for search purposes. COMICS STRIPS - Collected comics (owned), originally published in strip form. "Calvin & Hobbes", etc. Includes physical or electronic webcomic collections. TEXTBOOKS - College textbooks (owned). CONTEST ENTRIES - Prizes for contests/giveaways that I've entered, regardless of whether I won the book or not. Includes blog giveaways, LT Early Reviewers, and LT Member Giveaways. Books I actually won are marked with the tag "won". WISHLIST - Books that I don't own, but would like to. Includes books that have piqued my interest, though I wouldn't necessarily spend my own money on them. UPCOMING BOOKS - Wishlist books that have yet to be published. READ - Books that I've read, regardless of ownership. Does not include comic books, textbooks, etc., which may or may not be tagged "read". OUT ON LOAN - Books from my library out on loan to others. COVER SCANS - Book covers I've scanned. May include books not otherwise catalogued, or duplicates of books in other Collections. For high-res versions of my cover scans, visit this link. Check out my cover scan gallery here.